Now lets start exploring ways that President Obamas face has altered. 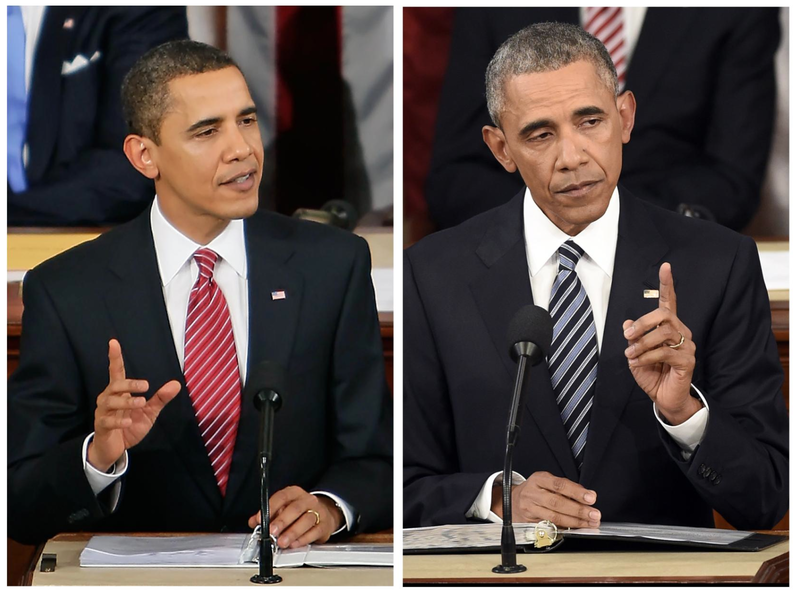 Again we’ll be using a photo for reference that compares Barack Obama giving his first State of the Union Address in 2009 with his delivering his last State of the Union last January. Do not open this photo link unless you feel prepared to see something quite shocking. Decisions are based on the principle of the thing. Not whether a choice will make him Mr. Popular. Considering that Obamas first term was spent trying to compromise with Congress, I think its a safe bet that he doesnt have this particular challenge. Perhaps the life lesson was learned before even becoming senator, while he worked as a community organizer. Potential challenges are flagged as potential in the system of Face Reading Secrets®. Sometimes a person learns the life lesson relatively easily. Sometimes the person never learns it at all. Although Ive worked professionally as a face reader since 1986, I have never seen this characteristic on any other persons face. Its not hard to recognize, Curious Reader. You just wont have many other chances to see it. What intensifies the shape of Obamas Straight Chin Bottom? Take a good look and youll see some well-developed muscle that adds an extra layer of toughness. Reminds me of bumpers on a car. How about you? Exceptional firmness about sticking to his principles, no matter what. Paying an inner price for stubbornly insisting on holding firm to what he considers necessary? President Obama actions and speech have been remarkably steady, doing what he could to pursue progress on issues where he spoke up during the presidential campaigns. This highly unusual Chin Bottom with Bumpers shows how he adapted spiritually to handle all the resistance… without compromising… and also without going out of his mind. Compare the vertical lengths of Obamas upper and lower lips. At its fullest, his upper lip is longer than his lower lip. Extreme negative reactions from those who dont like when he talks about taboo topics? Curious Reader, what will you find if once again you compare the vertical lengths of Obamas upper and lower lips? This time, at its fullest, his upper lip is equal to that of his lower lip. Technical point: Most people have a lower lip that is somewhat fuller than the upper lip. Thats why our POTUS still has the Outspoken Perceptiveness communication style that I wrote about in The NEW Power of Face Reading. Its just that he used to have a VERY extreme version of this communication characteristic. Perceptive speech, but not as strongly emphasizing taboo topics. Strong (but not as extreme) negative reactions from those who dont like when he talks about taboo topics? President Obamas changing face data suggests that he has pulled back just a bit from expressing as probingly as he used to. Americas first black president has, in my opinion, talked as much as he prudently could about the taboo topic of race. At a time when (amazingly, to me) Black Lives Matter is considered controversial, millions of Americans are hugely resistant to looking at racial inequity in America. Personally, Im relieved that President Obama is holding firm to his principles yet speaking less assertively than previously, under similar circumstances. This parallels the slight change to his lip proportions. Cheek Emphasis doesnt show on most faces. It means having extra heft somwhere around the cheek area, whether Close-Set Cheeks or Far-Set Cheeks, Low-Slung Cheeks, or what President Obama has developed, High Cheekbones. Most of us simply have cheeks, and thats plenty. But see what changed here, Curious Reader. Start by looking beneath President Obamas eyes. In the more recent photo, you will see prominent, unpadded cheekbones that stick out in sharp definition, like rocks. Power is used to uphold what is morally right. Yes, in Face Reading Secrets, all cheek characteristics tell you about personal style with power. Very, very few presidents so far have had facial characteristics that correlate with this bold personal style around power. The strongest example is a different president Ill be telling you about in Part 3 of this face reading series. Curious Readers, for now you might note that personal style with power that shows in a face is not to be confused with the real-world power that comes with occupying the Oval Office. Personally caring so deeply about what is right, anguish results from the inability to make a difference? This facial change jumped out at me first, soon as I saw comparison photos of President Obama. After more extensive evaluation of his face changes, I still think this is the biggest physical alteration, and the most important one, too. Personally I doubt that the potential challenge I just flagged has been overcome. Aura reading this president from these paired photos confirms that he has suffered intensely on a personal level from political resistance. Many observers consider that lack of political civility in America has reached a historic high (since the Civil War, anyway). In my opinion, now isn’t the time to blame. It’s to take peaceful political action: to donate, to volunteer, to do all you can to aim for a good outcome for the nation when we have our next election. And to vote. And it isn’t enough to pray, either. Yet of course prayer will help, and one of the greatest prayers might be for the United States to stay united in peace, as one nation under God, indivisible, with liberty and also justice for all. In case you’d like to learn more about face reading, here is a link to a podcast-style interview on “The Power of Face Reading” that I did with superb interviewer, Connie Bowman. Wow, those high cheekbones are striking! It’s like he has sprinted a marathon. I admire him so much, and admire that he is seemingly working just as hard as ever in his last months as President, honoring his commitment to the American people. He will deserve quite a rest.